Journey with your private Egyptologist guide in Cairo for your entire itinerary on our Great Egyptian Discovery. Explore the ancient wonders of the world, staying in historically rich cities along the Nile like Luxor, Aswan, and Alexandria, as well as an included exploration of Abu Simbel. This all bookends a grand Nile River cruise for four (4) nights. 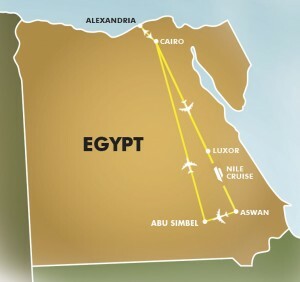 Travel with a Private Egyptogolist throughout your journey. The timeless Nile River snakes through the city of Cairo – the beating heart of Egyptian culture. Exploring the metropolis will reveal a rich cache: from the astonishing pyramids to the old Cairo Museum, stuffed to the rooftops with priceless antiquities. Discover modern architecture, ancient mosques and plenty of urban sparkle! Next up: Luxor and the awe-inspiring temples on the East Bank. Marvel at the well-preserved monuments before a travelling across the Nile to explore the Valley of the Kings. Descend into tombs with brilliantly colored hieroglyphics that appear as vivid as they did when the artist laid down his brush 4000 years ago. Luxor is also where the Nile Cruise adventure begins – 5 days floating on the river, observing life along the muddy banks. A private Egyptologist makes history come alive and allows for a leisurely and personalized exploration of each site. Disembark at Aswan for a visit to the Unfinished Obelisk and the famed Aswan Dam- a marvel of modern engineering. Wing to Abu Simbel – one of the natural wonders of the world. The marvelous temples are perfect homage to the endless ego of Ramses the Second. Alexandria, “The Pearl of the Mediterranean”, reveals an ambience and cultural heritage that is almost un-Egyptian. The sunken lighthouse of Pharos and other antiquities discovered in a watery grace have given rise to speculation that Alexandria might be the fabled Lost City of Atlantis! For a memorable vacation combining antiquities and wildlife, extend your adventure to Kenya. Meet your private Egyptologist who will be traveling with you through the journey! Enjoy Cairo’s exceptional sights: pyramids, Sphinx, Museum and Khan el Khalili Bazaar. Fly south to explore the fabulous Temples of Karnak and Luxor, the Valley of the Kings and Queen Hatshepsut’s remarkable temple. Enjoy a superb Nile cruise, disembarking at Edfu and Kom Ombo to explore the Temples of Horus and Sobek. Tour the High Dam and Unfinished Obelisk. A short flight to Abu Simbel and explore this magnificent ‘wonder’ of the ancient world. Drive to ‘Cleopatra’s city’ for sightseeing: the Greco-Roman Museum and Pompeii’s Pillar. Enjoy a special lunch in the colorful Fish Market. Return to Cairo and relax before departure.